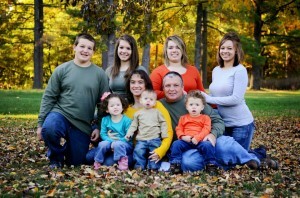 Carla is a wife and a devoted mother of seven children. She graduated high school in Stronghurst Illinois, and later received a degree in medical/clinical assistance. Her and her husband Roy’s passion for mission work began nine years ago with a church-sponsored trip to Mexico. Since that time, their entire family has been taking annual trips across the border where they build homes for the poor, distribute food to the hungry, and spread the message of hope that comes in Christ. They also enjoy domestic mission work, and often open the doors of their home to individuals in need. The Days have lovingly adopted three young children through the foster care system. Carla says her greatest joy is witnessing God’s hands at work—whether it’s in Mexico, a tornado ravaged community, or in their own home. One of Carla’s favorite Bible verses is Psalm 46:10. When life seems crazy (with seven kids, when does it not), she reminds herself to “Be Still And Know That He is God”! She loves spending time with her husband Roy and lovingly supports him as he seeks to bring glory to God through his travels. Her passion in life is raising and installing Godly values in their children.